Rocket League is a vehicular association football video game. 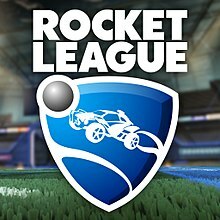 It is developed and published by Psyonix. It was first released on Microsoft Windows and PlayStation 4 in July 2015. It was later released on Xbox One, OS X and Linux in 2016. It is a sequel to Supersonic Acrobatic Rocket-Powered Battle-Cars (2008). It is multiplayer and single-player. Single-player has the "Season" game mode where the player plays against bots. Multiplayer is online and has 1 versus 1, 2 versus 2, 3 versus 3 and 4 versus 4 modes. Players control a rocket-powered car and use it to hit a ball that is much larger than the cars towards the other team's goal area to score points. The game has received very positive reviews. As of January 2017, the game has had 25 million players since 2015. ↑ Makuch, Eddie (January 11, 2017). "Rocket League Passes New Milestones". GameSpot. Retrieved January 30, 2017. This page was last changed on 1 April 2019, at 12:27.